Mapping the past – now for something completely different. I’ve been fiddling for some time now with digital maps. I’ve always loved their paper forebears; a map is a promise, a portent of future exploration, a pointer to places and journeys yet to be experienced. 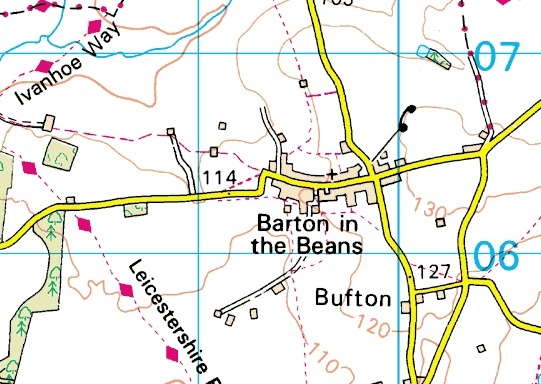 When I open a map, it takes me right back to my childhood, to evenings lying on the living room floor with an old Ordnance Survey sheet spread out before me. It didn’t matter that it was 20 years out of date – the colours, the names, the typeface, the mystical symbols were all magical to me. They made me want to push the boundaries of the world I knew and to find the villages with funny names, the woods, back lanes and streams. 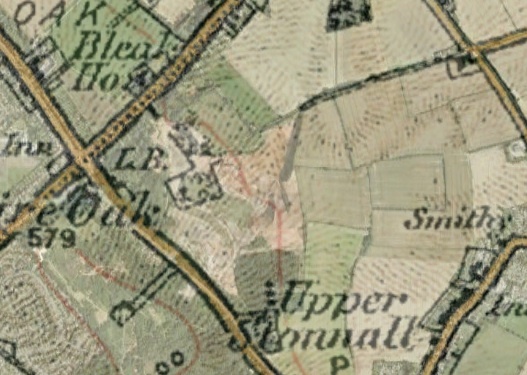 The love of cartography – in particular, the very British cartography of the Ordnance Survey – has persisted throughout my life. I’ve collected many sheets from differing periods and at many scales, and rarely pass a secondhand bookshop without taking a look at what they have. I scour eBay for old prints, and adore the window on the past which I’m now able to recognise they provide. The art of such maps is fascinating. Against this backdrop, I’m also a gadget nerd who loves GPS and the ability to use the same OS maps on the computer as I can on paper. The digital age has made possible the kind of sci-fi daydream I had as a kid, that of seeing exactly where I am on a scrolling, dynamic map. Alongside, the internet has provided that voyeurs delight, Google Earth. I spend hours mooching around on this remarkable application, peering at the geography of my life, marvelling at the insight into gardens, factories, woodlands and housing estates. Regular perusers of this blog will be aware that one of the facilities Google Earth provides is Panoramio – using which I’ve now uploaded in excess of 800 geolocated photos, placed on the map at the location I took them. The acquisition of a new GPS unit at Christmas has taken my cartographical crush to a whole new level – with a Garmin Oregon, I now have scrolling, 1:50000 Ordnance Survey maps, searchable and routable, easily accessible right there on my handlebars. Along with this facility, the device allows you to use your own maps, scanned by hand and calibrated using Google Earth. The facility is quite limited at the moment, but in a drive to understand this feature, I hit upon something that will be quite interesting to local history buffs. I’ve discovered that Google Earth allows the overlay of images upon the aerial photography it normally shows. These images – called overlays – can be quite large in size, and the user can adjust the transparency of the overlay at will, allowing the earth imagery to project through it. I started experimenting with current digital mapping imagery, and once I’d cracked the principle, my mind drifted to trying the process with older maps I’d scanned from my collection. At the foot of this article, you’ll find links to download some of my overlays. With the relevant overlay selected, pull the slider at the bottom of the pane to adjust its' transparency. The map overlays are very easy to use. First of all, if you haven’t done so already, go to the Google Earth download site and install Google Earth. All you then need to do is download the file (I’m using an external sharing service called Box), and then, if necessary, find the downloaded file and click on it. 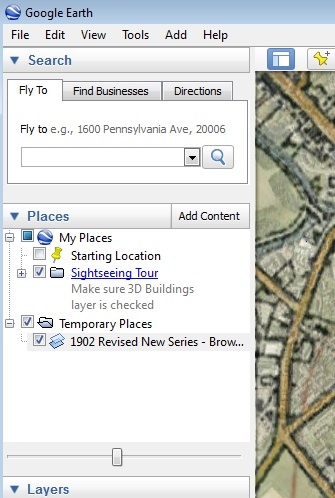 Google Earth will start automatically, and zoom in to the map section, which will be completely opaque. If you look to the ‘Places’ pane at the left-hand side of the Google Earth window, you’ll see the overlay highlighted, with a horizontal slider at the base of the box. Pulling that slider adjusts the transparency of the overlay. Several overlays can be loaded at once, and they can be faded into each other at will. Thus one can see the development of Brownhills as it progressively urbanised over the course of the last century. I think you’ll agree, that’s quite magical. There are one or two caveats, however. Remember that the maps involved have been through several photographic processes during their history, and although remarkable accurate, they do show drift due to scanning problems, printing gremlins and paper creep. These maps were also hand-drafted, so human errors are also not unusual. Finally, I’d also point out that these maps came from paper sources. The Ordnance Survey are going through interesting times in a digital age of free online route planners and other mapping services. If you discover a love of this mapping, do try to acquire the paper versions. They are not just a map, but documentary evidence of times past. Maps aren’t just about where you’re going to, but where you’ve come from. You can never have too many of them. 1900-1901 Six Inch Series – Brownhills – Early large scale map. 1959 Seventh Series – Brownhills – Based on the 1947 survey. 1962 Seventh Series Fully Revised – Brownhills – Based on a much later survey than the 1959 map. This entry was posted in Brownhills stuff, Chasewater, Clayhanger stuff, cycling, Environment, Fun stuff to see and do, Local History, Local media, Shared media, Walsall Wood stuff and tagged Brownhills, Brownhills local history, Brownhills maps, Clayhanger, Custom Maps, digital maps, Garmin, Google Earth, Google Earth overlay, GPS, Local History, Old maps, old maps of Brownhills, Ordnance Survey, Oregon, OS, Panoramio, Shire Oak, Staffordshire, Walsall Wood. Bookmark the permalink. 23 Responses to Mapping the past – now for something completely different. Following your kind comments about my latest photograph, I journeyed to this blog. I tried out the map overlay on Google Earth, you have done a good job there! I also use a GPS when on my ‘bike, a Garmin Vista, which I use for geocaching, (quite a few in the local area) keeping a record of exactly where I’ve been, and to geotag my photos. Handy little gadgets aren’t they? It’s sad about the snow, but WordPress – the hosts of this blog – offer it as a little festive adornment which automatically ends on the 5th of January. I quite liked the snow. Cheesy but nice. Thank you Bob for those fantastic overlays. My partner Lynne and I have loved maps since childhood. When Lynnes health started to fail she became The Navigator and I merely the pilot.Always an alternate route available in her brain, who needed Sat Nav ? She died in November and now I have bumble around solo. A great fan of Google Earth and Midlands History Lynne would also have appreciated your efforts. Can’t believe I missed this post first time round – utter genius! Thanks for linking back to it Bob (from the Pelsall 1902 post).